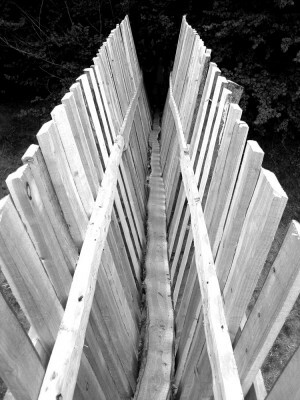 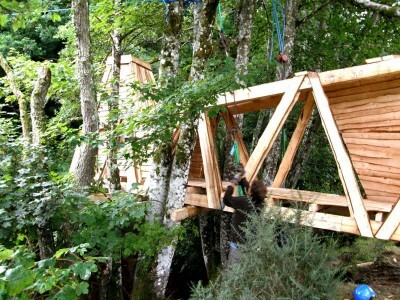 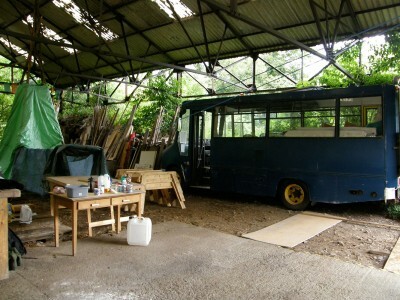 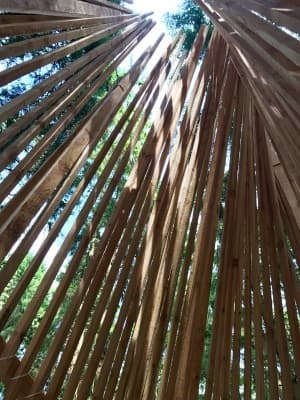 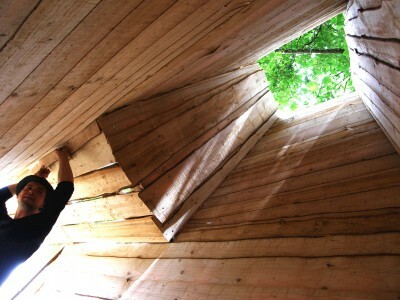 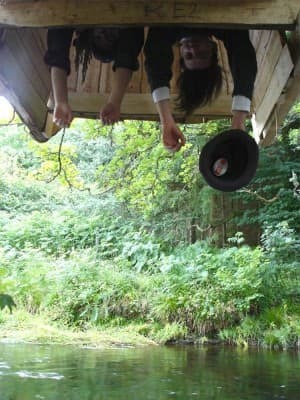 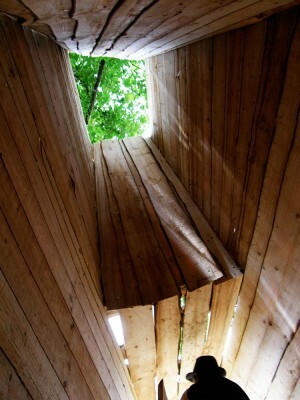 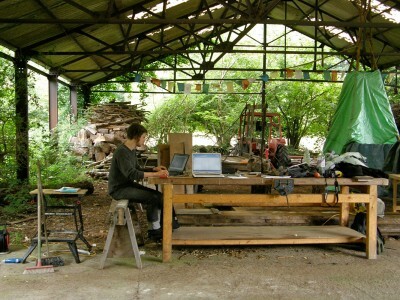 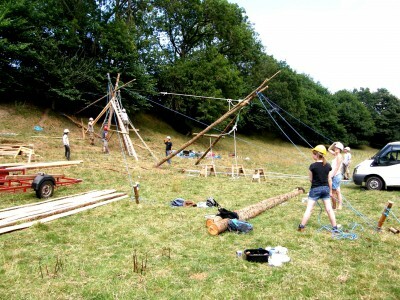 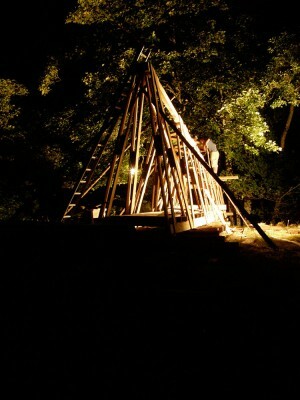 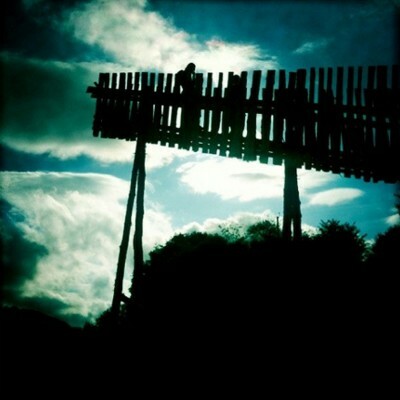 Studio in the Woods is an ongoing education and research project established in 2005. 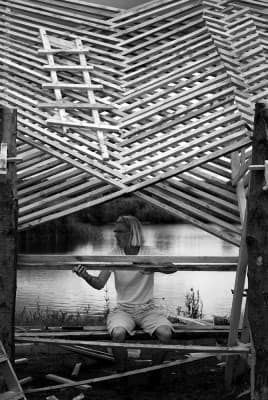 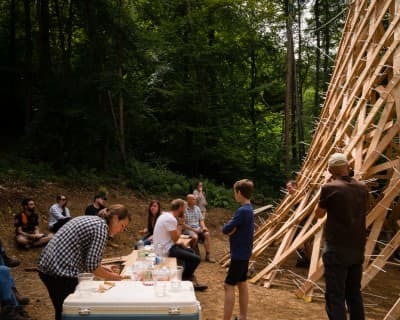 It was founded and is convened by Piers Taylor (Invisible Studio) with Kate Darby (Kate Darby Architects), Meredith Bowles (Mole) and Gianni Botsford (Gianni Botsford Architects) as a vehicle to test ideas through making at 1:1. 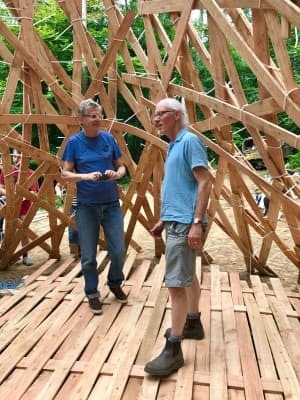 Each year, Taylor, Darby, Bowles and Botsford have been joined by a number of other practitioners and academics in leading workshops with students over 3 or 4 days in summer time. 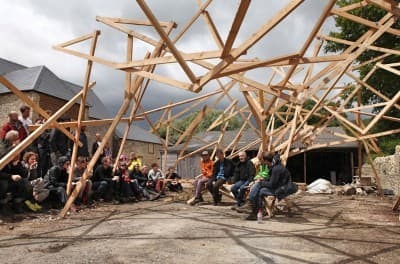 These workshop leaders include Barbara Kaucky and Susanne Tutsch (Erect Architecture) Je Ahn and Maria Smith (Studio Weave) Lee Ivett (Baxendale) Lynton Pepper (Architecture00) Shin Egashira (Architectural Association) Lina Gotmeh (Lina Gotmeh Architecture) Toby Lewis and Akos Juhasz (Feilden Clegg Bradley Studios) Fergus Feilden (Feilden Fowles) Guan Lee (Grymsdyke Farm/Bartlett) Hannah Durham (Cullinan Studio) Charley Brentnall (Carpenter Oak) Zoe Berman (Berman Studio) Carolina Vasilikou (University of Reading) Tim Price (Price and Myers) and Jack Hawker (Momentum). 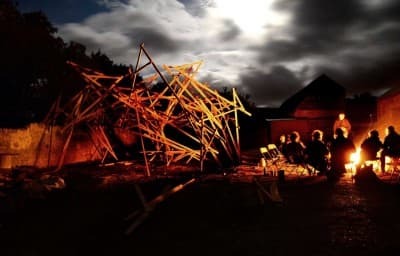 Visiting critics are Niall McLaughlin, Robert Mull, Peter Clegg and Ted Cullinan. 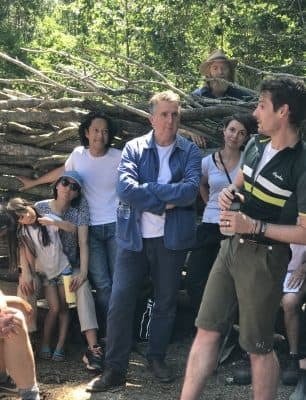 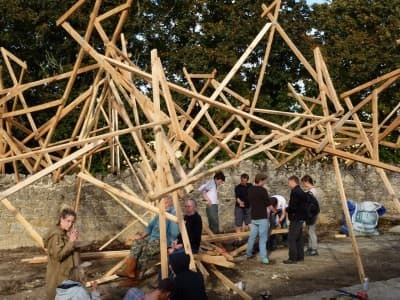 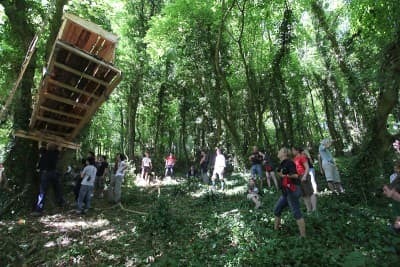 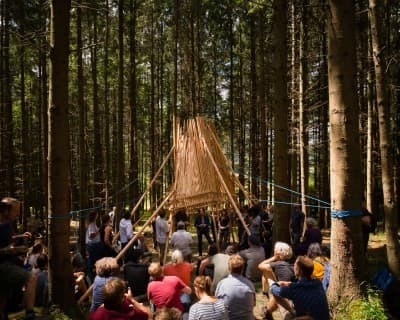 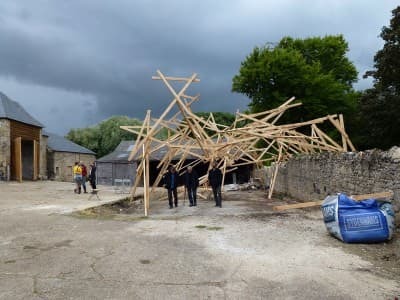 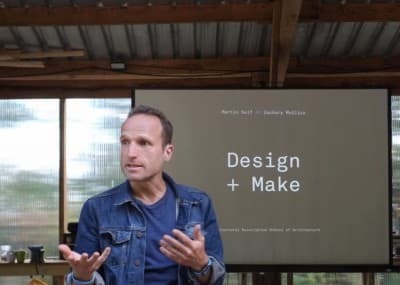 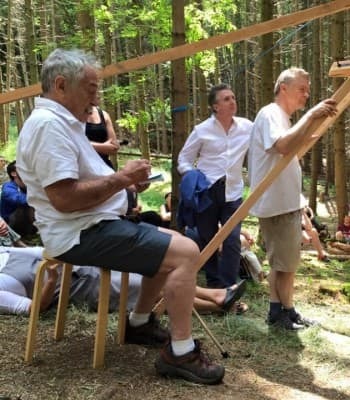 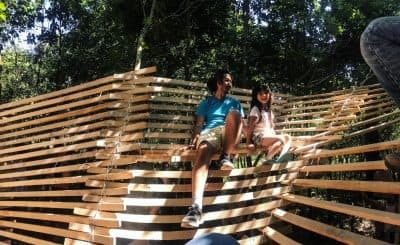 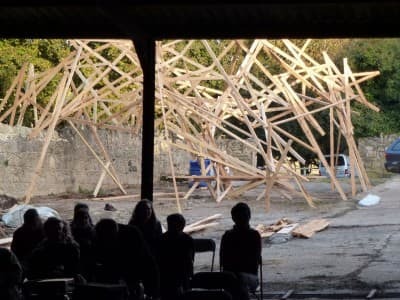 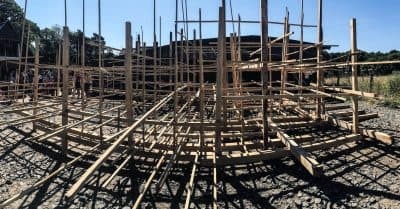 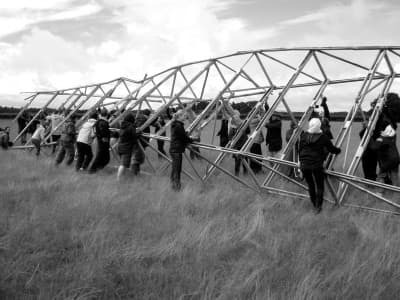 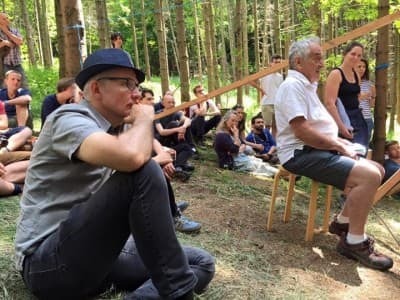 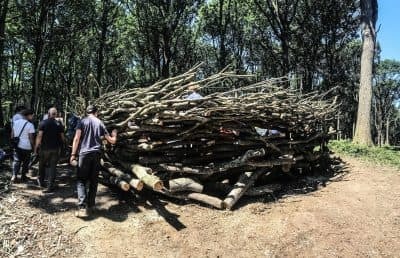 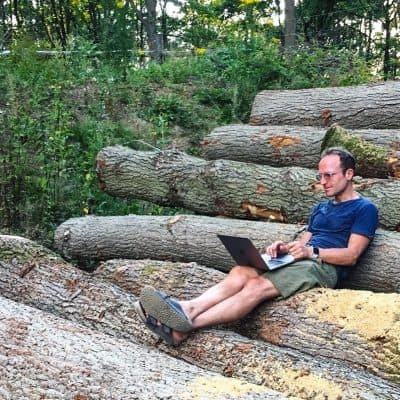 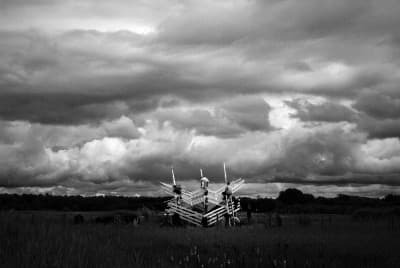 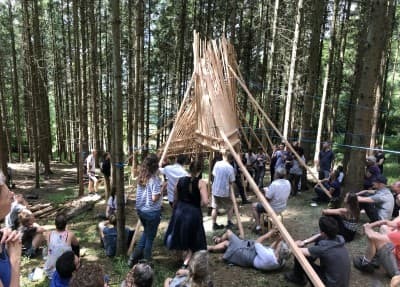 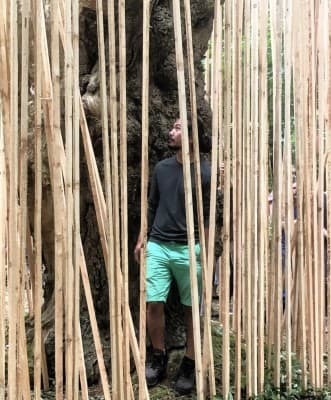 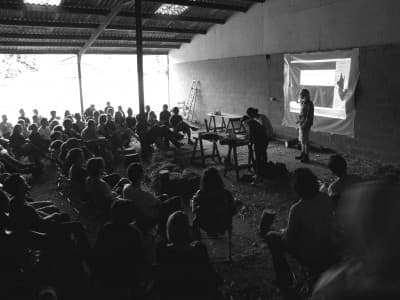 Studio in the Woods is now part of the Global Free Unit Network which has a number of ‘classrooms’ globally where power is handed back to the student and learning can take place outside of the framework of conventional academic institutions. 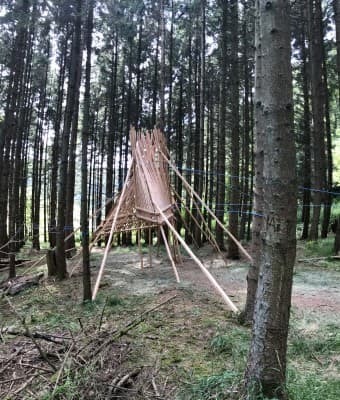 Studio in the Woods lands in a different context each year, and has taken place in a number of different locations around the UK including the woodlands managed as part of the Invisible Studio Project, where Studio in the Woods started. 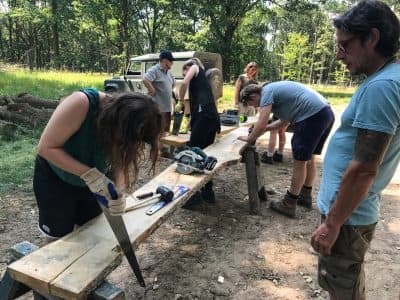 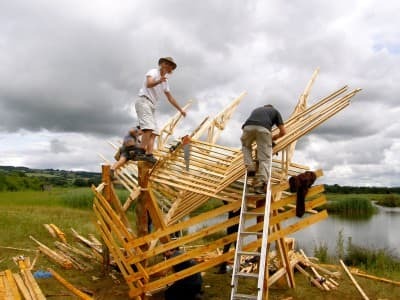 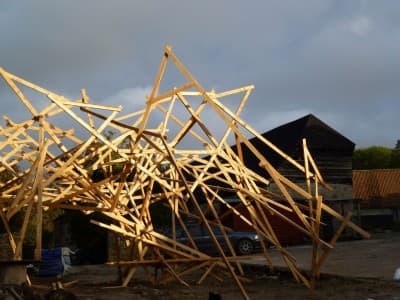 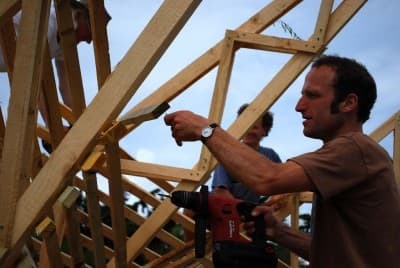 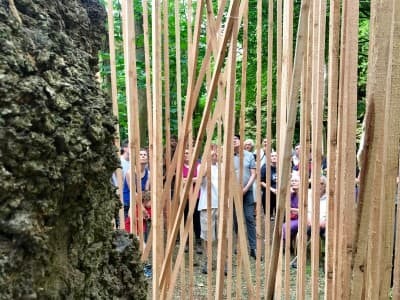 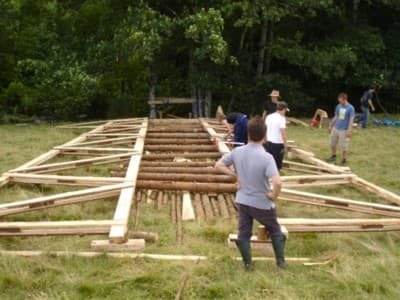 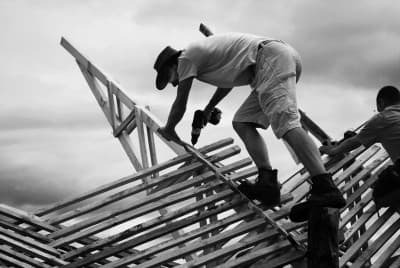 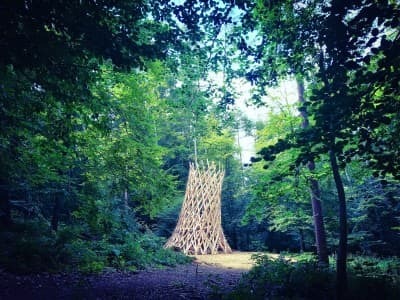 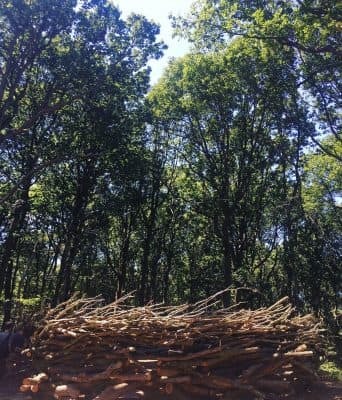 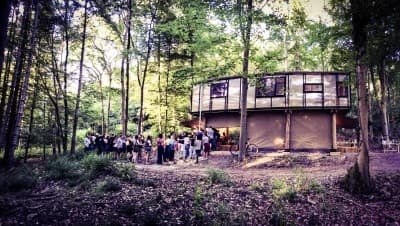 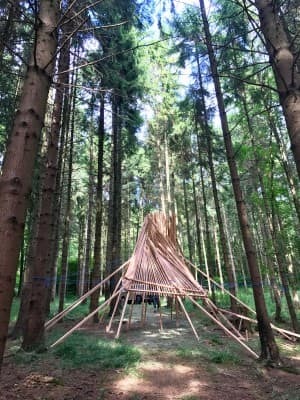 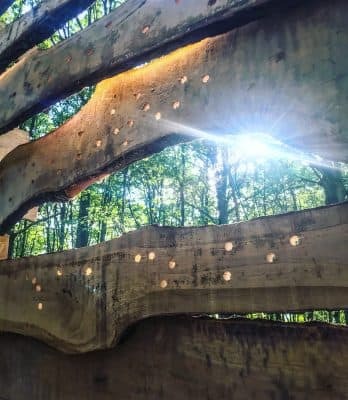 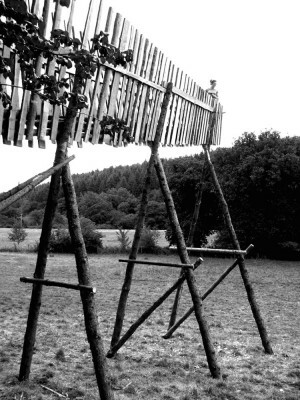 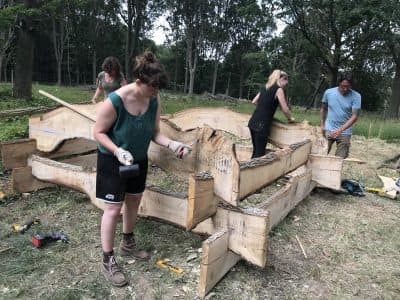 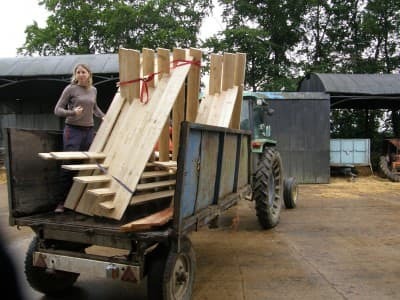 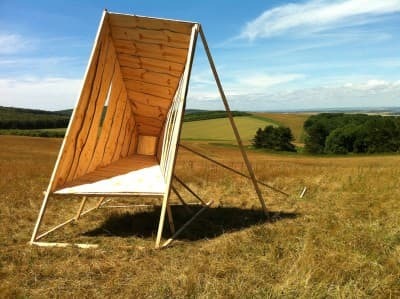 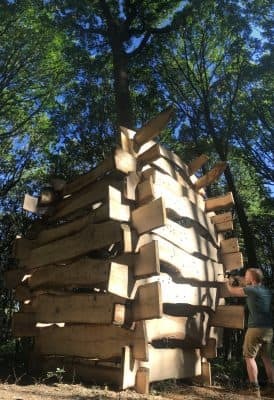 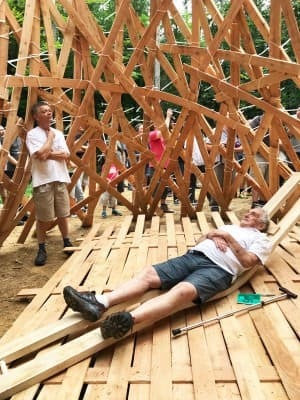 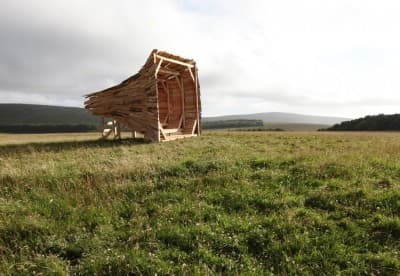 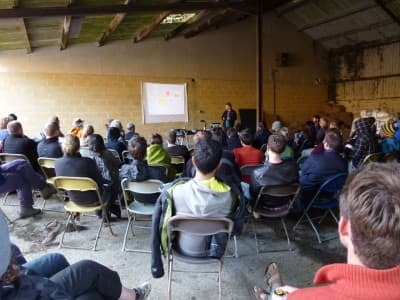 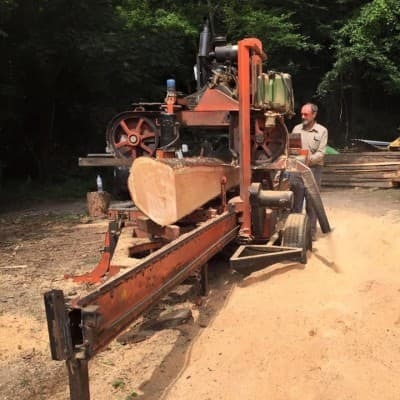 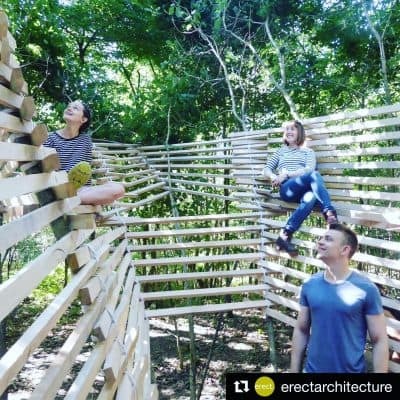 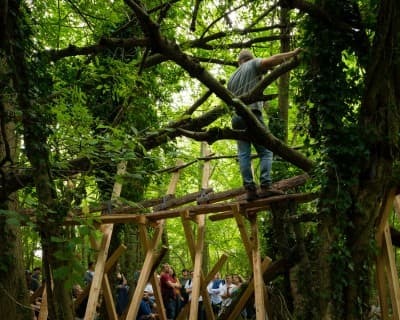 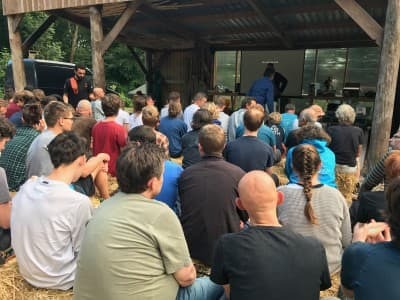 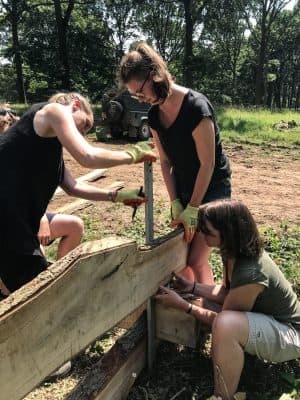 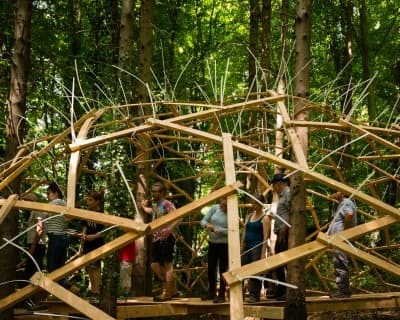 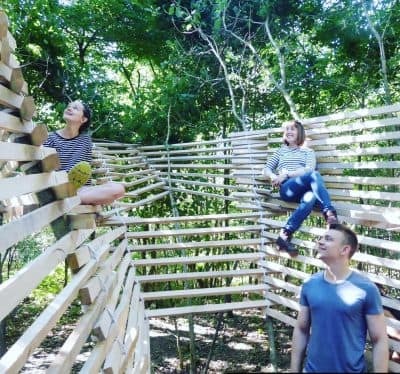 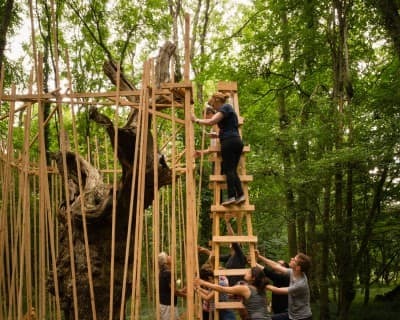 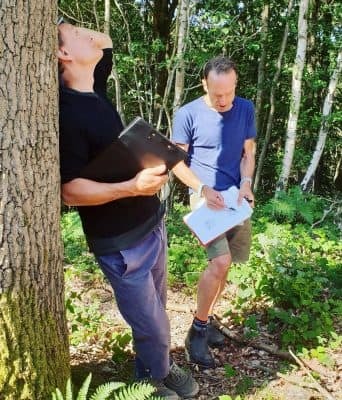 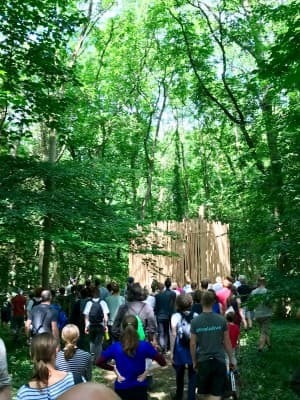 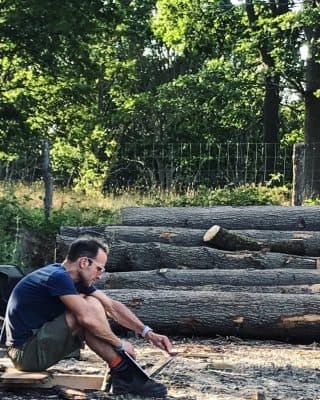 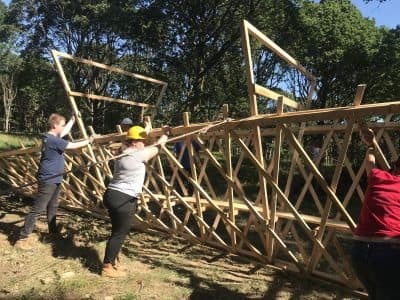 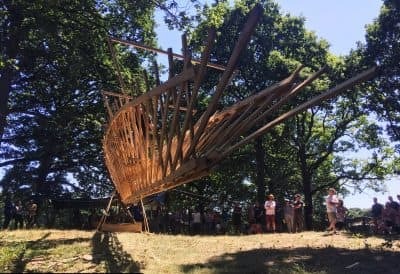 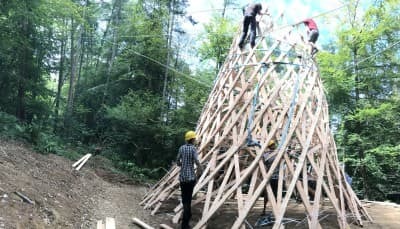 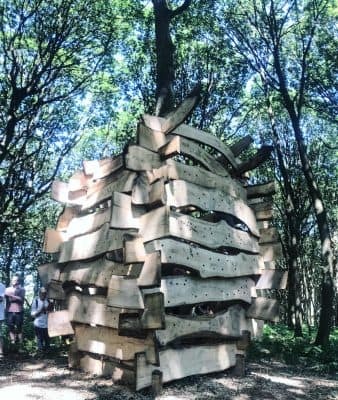 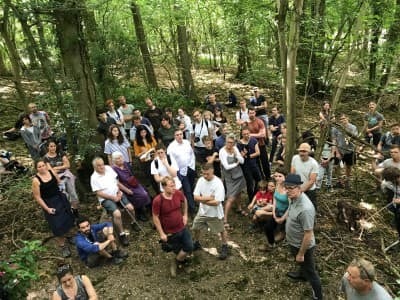 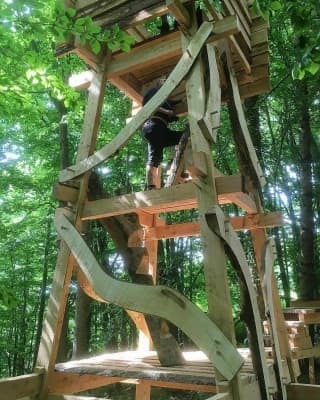 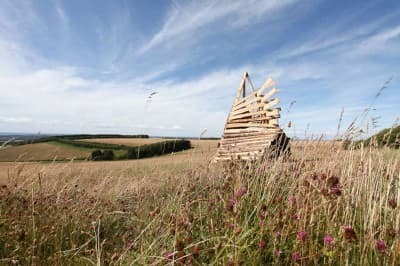 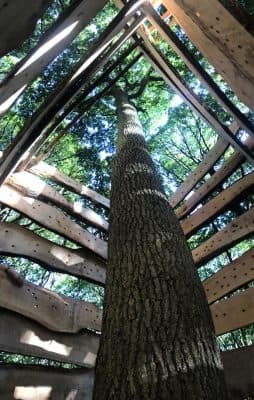 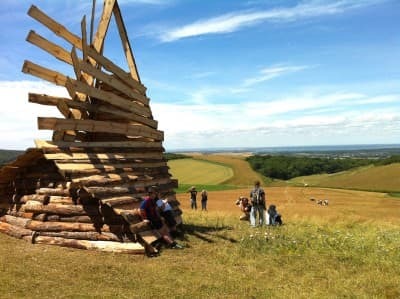 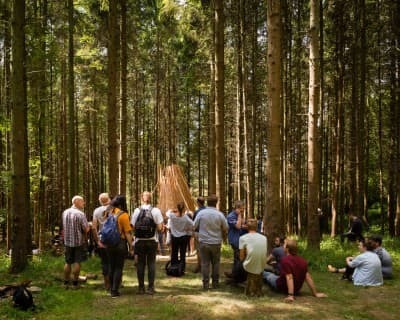 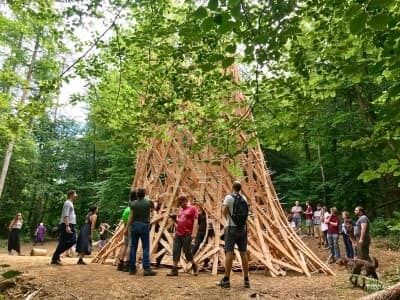 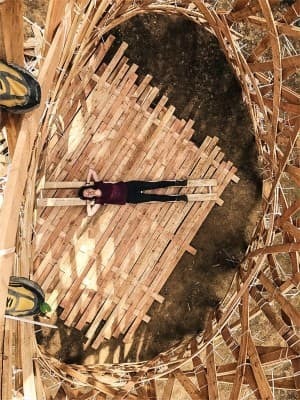 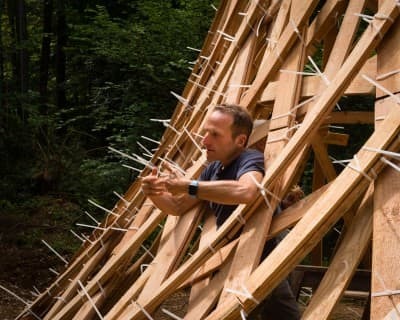 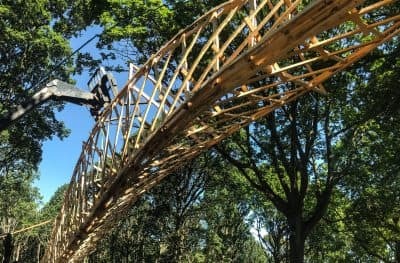 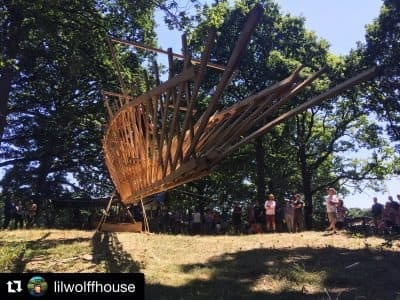 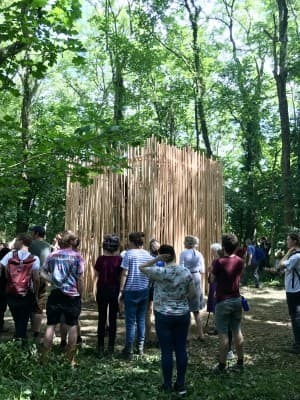 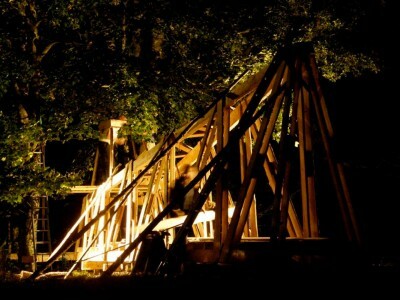 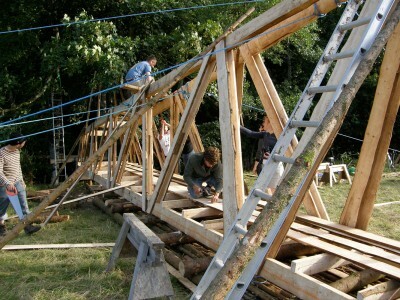 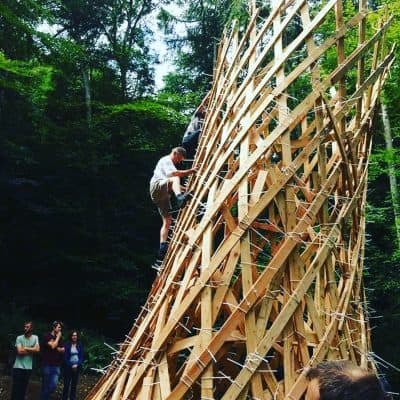 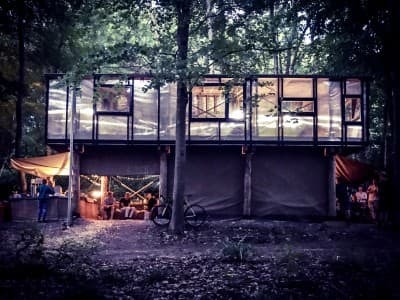 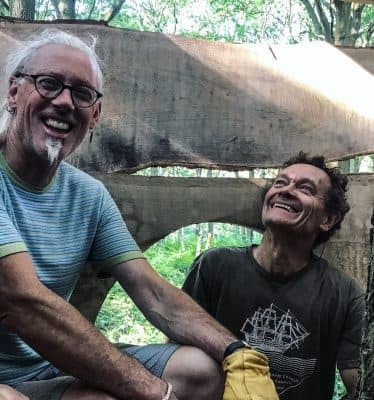 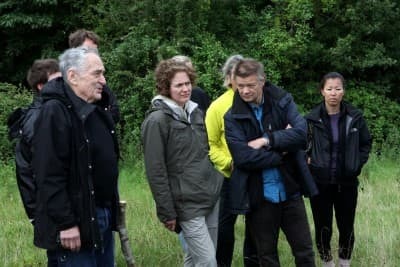 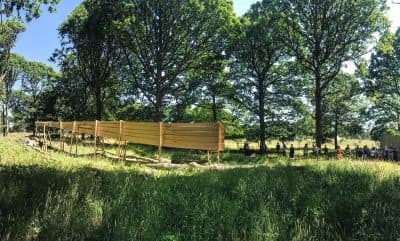 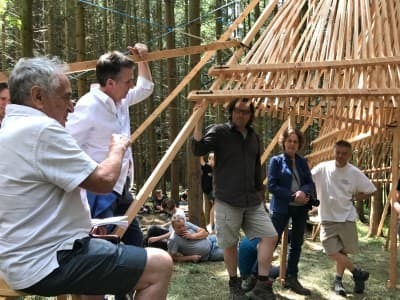 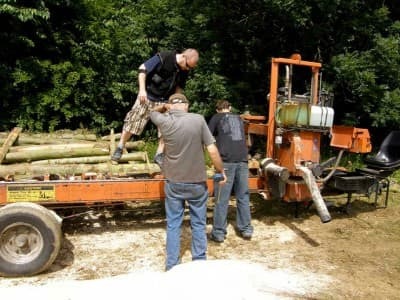 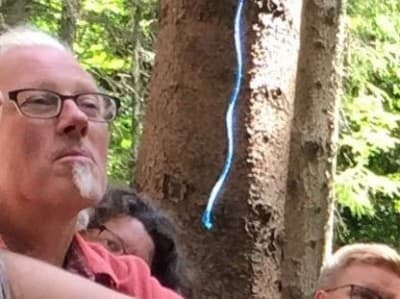 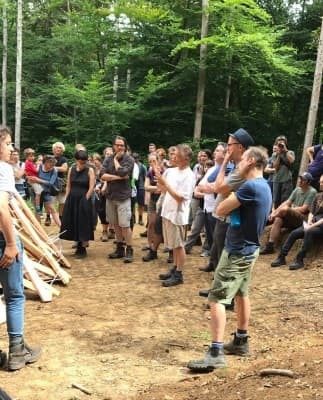 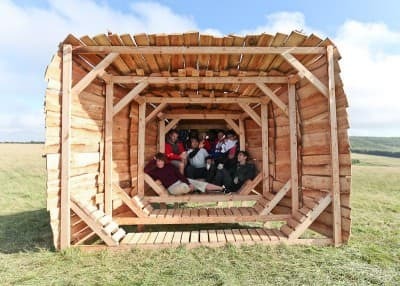 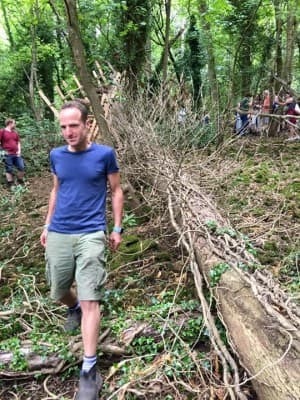 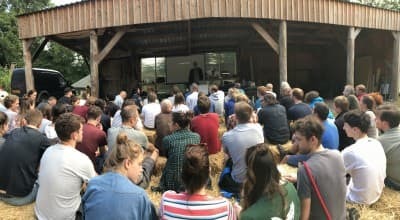 In 2018, Studio in the Woods decamped to the Wyre Forest and was hosted by the Wyre Community Land Trust with funding provided by the Guild of St George with additional funding from the Ruskin in Wyre HLF project as part of a strategy to explore future uses for the timber from the Wyre Forest. 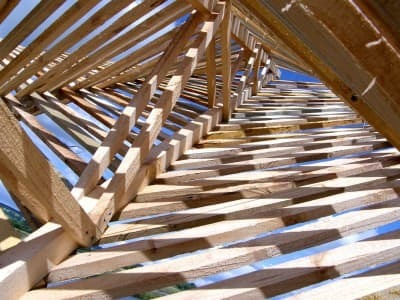 Astonishing as it may seem, most architecture Students have limited contact with real materials or construction and instead operate in a kind of parallel universe where projects are imagined in abstract at scale in a kind of weird digital code space, a space where ad hoc, inventive and impromptu decision making is excluded from the design process. 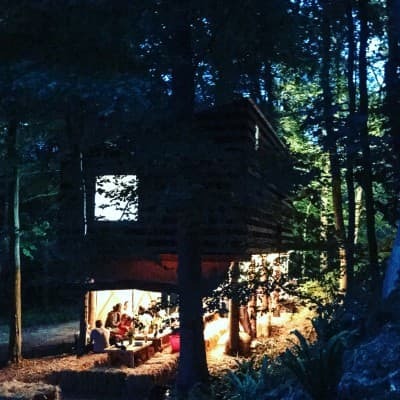 Studio in the Woods began as a reaction to this about 12 years ago, but didn’t begin with a manifesto – I simply asked the cleverest and most interesting architects I knew if they fancied coming down to the woods around my house to make some stuff with some students over one long hot weekend in July. 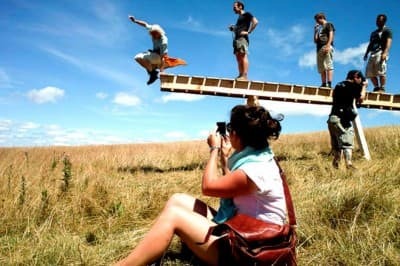 To a certain degree, I’m always slightly nervous of premeditating too much, and taking a cue from Dylan, we just threw the cards up in the air to see where they landed. 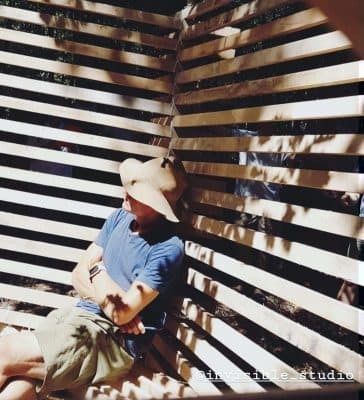 Where they landed – or what came out of the first weekend – set the pattern for subsequent years. 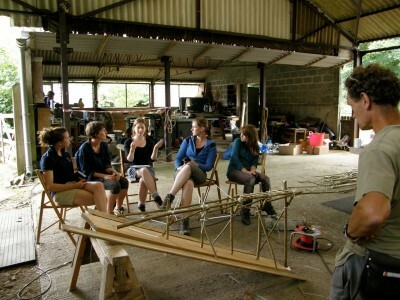 We’d ignore any given brief, and, in about 5 parallel groups of architects and students over three days, design and construct– with a simple kit of parts and a limited palette – a research project over three days, and we’d intersperse the incredible hard work with great food, compelling talks and pearls of poetic wisdom from Niall McLaughlin & Ted Cullinan and sound pragmatic advice from Peter Clegg, and refreshing irreverence from the punk designer David Connor. 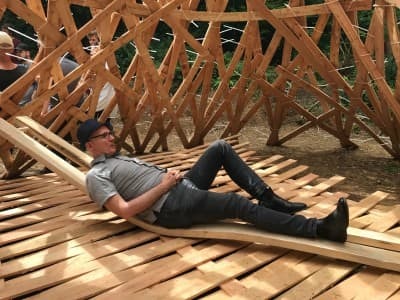 Over time, we all fell in love with timber – we’d all had limited contact with it, and it was thrilling to embrace the tactile, volatile and almost carnal qualities of wood. 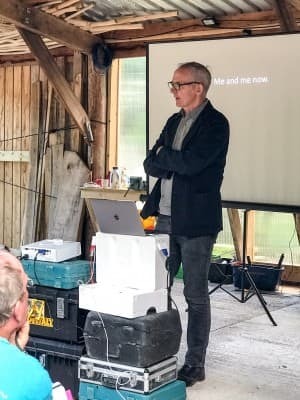 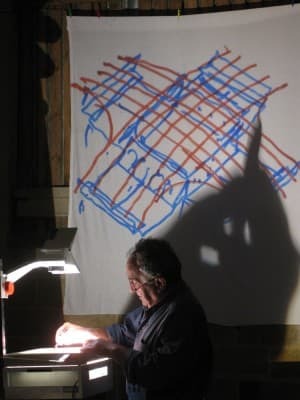 Studio in the ­Woods doesn’t really exist – it’s an invisible studio and was the initial inspiration for a way of working that became my practice – Invisible Studio. 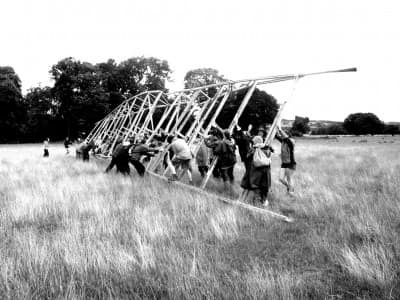 There’s no institution, no one owns it, no organisation funds it, no one audits it, and it is beholden to no one. 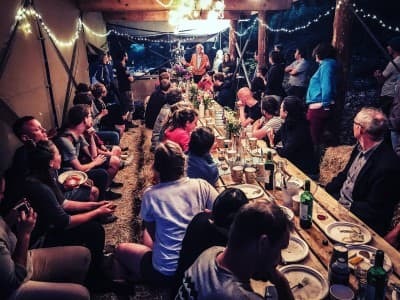 It’s a group of people that have come together each year for the last twelve years, and each time there’s never any sense that it will necessarily happen again. 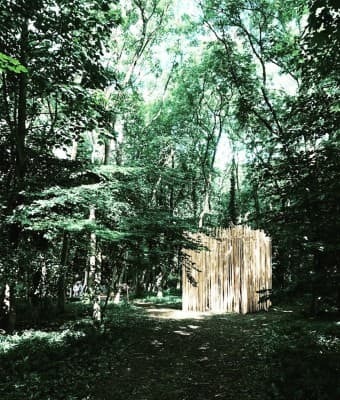 Like my practice, I like to think Studio in the Woods happens despite me, not because of me. 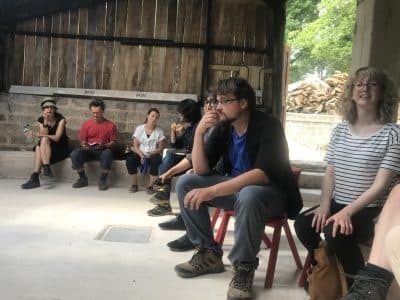 It grew out of a frustration of having taught in institutions that I felt out of synch with, places where people talked about learning outcomes above all else, and out of a joy I felt in the chaos and surprise of making quickly at 1:1. 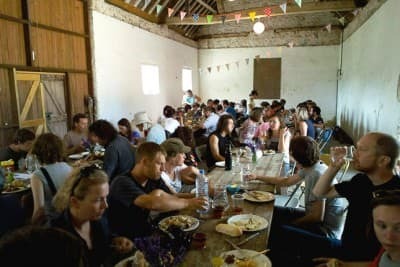 It was also, selfishly, a way of getting together many of the people I had respect for, hanging out with them for a few days and watching them do their stuff. 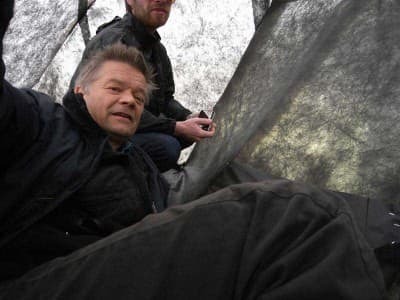 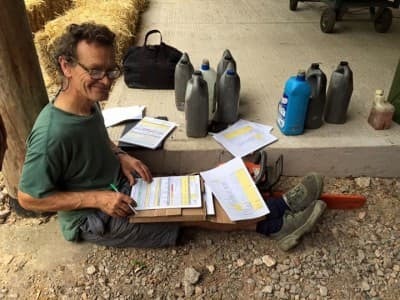 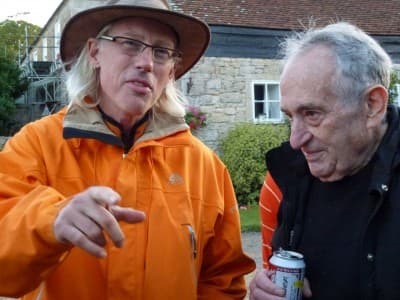 In addition to Peter, Niall and Ted, These people were Meredith Bowles, Kate Darby, Gianni Botsford, Toby Lewis, Charley Brentnall, and in recent years Susanne Tutsch, Barbara Kaucky Je Ahn and Maria Smith, Akos Juhasz, Fergus Feilden, Lynton Pepper and Lee Ivett. 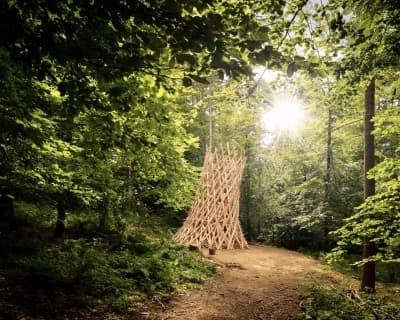 We’ve also been joined by Toby Maclean, Lena Ghotmeh, Shin Egashira and Martin Self (who led the AA pavilion projects and now is the Director of the AA’s Hooke Park) to name a few, plus, of course, the brightest and best students from all over the world. 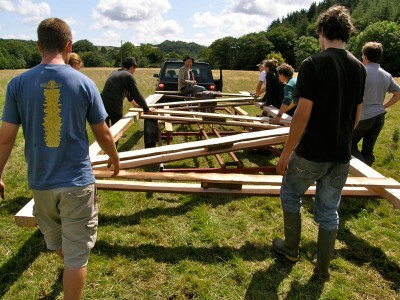 There’s been a desire for those on the outside to try and pigeon hole what we do – that it’s either ‘wilfully odd’ (astonishingly, from a BA course leader at a mainstream University), or as if being interested in wood and place means we’re only interested in wood and place and as if mainly operating with lo-tech equipment during the workshop means we’re somehow anti technology and anti modernity. 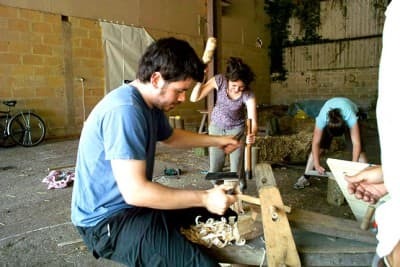 Quite the reverse is true, and I suspect that one of the questions that many of us have in the back of our minds is how the realm of digital simulation and fabrication can co-exist with adzes, spuds, cat’s paws, hammers and chisels. 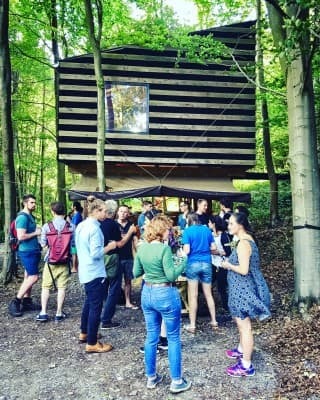 In many ways Studio in the Woods is a celebration of our diversity (as individuals, as a group) as much as our similarities and I’d hate it to be limited to a predefined ethos. 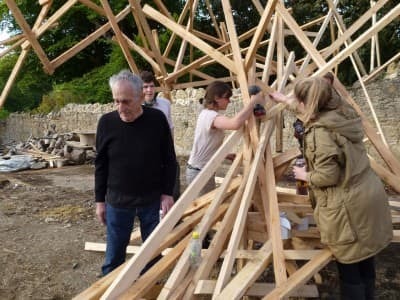 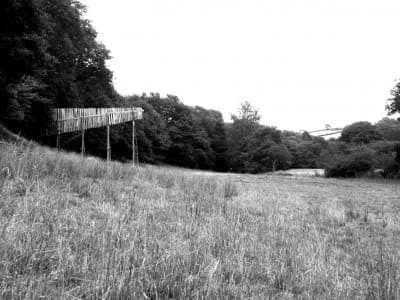 Niall McLaughlin called it ‘a place ‘where builders, architects and students collaborate on projects, paying reverence to the overlooked and the nearby’.